Creator Steve Purcell discusses the characters' origins and the classic adventure game in this archive interview. Retro Gamer is an award-winning monthly magazine dedicated to classic games, with in-depth features from across gaming history. You can subscribe in print or digital no matter where you are by clicking this link. This month's issue features GoldenEye 007 on the cover—take a look. Welcome to the first Retro Gamer guest article on PC Gamer, where we feature PC-focused articles from across the magazine's long history. This making of Sam & Max Hit The Road was originally published in issue 22 of Retro Gamer all the way back in 2006, and here it's presented online in full for the very first time. Great double acts are commonplace in the world of film, television and comedy, but games have very few duos that stick out. As far as we’re concerned, one such pairing stands out above all others—and we don’t mean Firo & Klawd. 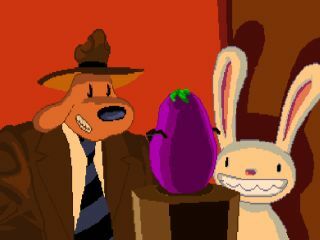 Whether they were gracing the pages of a comic book, the television screen or a PC monitor, Sam & Max is the strangest of teams. With his trademark suit and dry wit Sam is a typical gumshoe, except, of course, he's a floppy eared dog. His sidekick Max, meanwhile, is a completely naked bunny rabbit with a set of teeth that would put Jaws to shame. The pair starred in LucasArts’ Sam & Max Hit the Road, a hilarious adventure game in which the two ‘hit the road’ in search of a missing Yeti. Along the way they found themselves visiting some bizarre tourist hotspots like the world’s biggest ball of twine and an alligator-infested crazy golf course. The game was both a showcase for the madcap title characters as well as a parody of America’s weird and wonderful tourist sights.